Medford, OR – January 16, 2018 – Providence Medford Medical Center and Mercy Flights Inc. are teaming up to increase access to healthcare services for Jackson County residents through a $23,500 grant from Providence to support the Mercy Flights Mobile Integrated Healthcare Program. 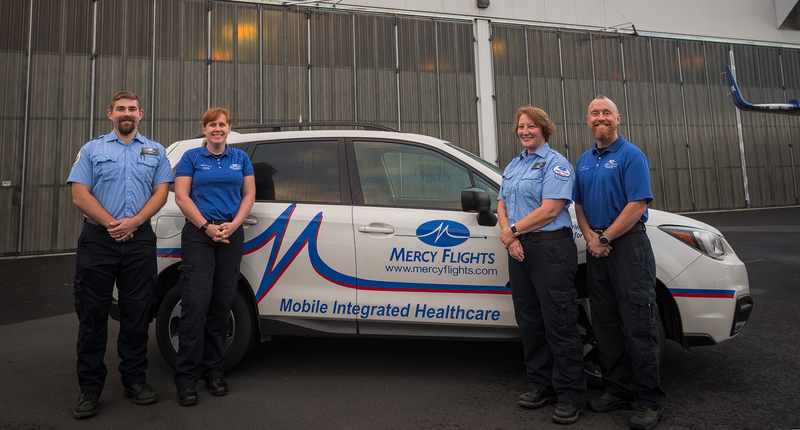 The MIH program, created by the Mercy Flights team in 2016, provides home paramedic visits to local residents who face preventable health risks. The MIH program is designed to help patients manage their health, assist them with recovery after hospitalization and reduce the risk of unnecessary emergency department visits and hospital admissions. Providence will present Mercy Flights with a check on Thursday, January 18th at 8:30am in the Mercy Flights’ Hangar at 2020 Milligan Way. The grant award is part of the Providence Community Benefit Program which works to improve health for vulnerable populations in its Southern Oregon Service Area. According to Stewart, much of the home medical visit work involves patient education about chronic disease and insurance benefits, identifying and addressing barriers to care, and connecting patients with appropriate resources, including behavioral health and primary care providers. To avoid duplicating services, Stewart said the Mercy Flights team makes home visits based on requests from other providers and resources working with patients. “Providence is a long-standing partner of Mercy Flights and we share the goal of meeting local needs, filling gaps and reducing healthcare costs. We are grateful for this grant and the opportunity to further enhance services for the people of Southern Oregon,” said Stewart. © 2018 Mercy Flights | Nonprofit Air and Ground Ambulance Services.